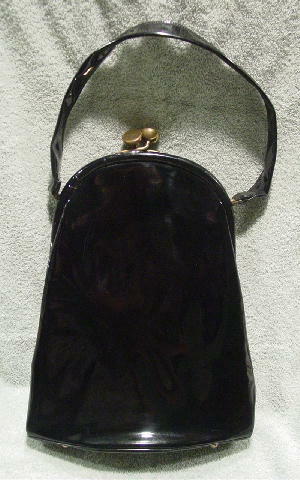 This vintage very tall black patent leather purse has a 22 1/2" by 1 1/4" handle and a large tarnished gold-tone bypass closure. The bottom has 4 tarnished gold-tone feet. The surface on both sides has quite a few scuff marks. 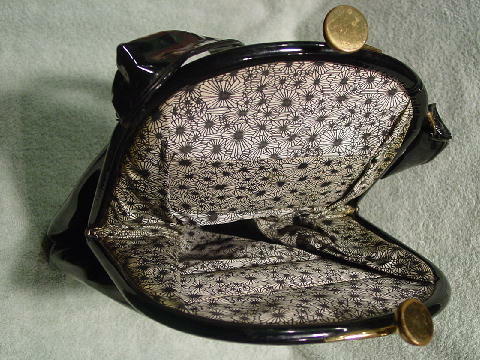 The interior has a synthetic fabric (has quite a bit of body to it) lining with a black and white flower design. Each interior side has a small open pocket.